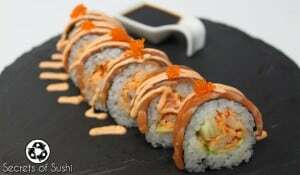 There is a lot of controversy out there about using cream cheese in sushi. Some people love it, while many others hate it. It’s certainly not traditional, but it is undeniably popular. 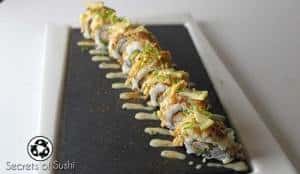 All too often, I see sushi chefs using cream cheese as if they don’t know what they’re doing – they constantly put so much cream cheese in the roll that it might as well be the only ingredient! 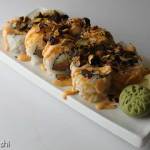 However, there are a few instances of sushi recipes that really nail this new concept and use cream cheese to create complex flavor combinations. 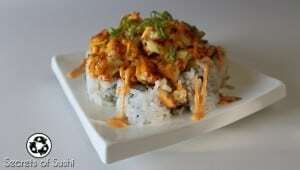 I recently went to a sushi bar, called Full Moon Sushi, that blew me away. 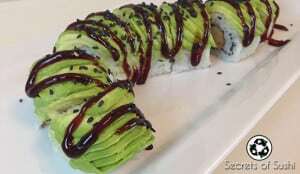 What stands out the most about this sushi bar (aside from the awesome staff) is their use of cream cheese. At first, I thought they would be making the same mistakes as so many other sushi bars. But after ordering the Devil’s Advocate, I realized they had found a way to use cream cheese to maximize the flavor potential! There are obviously a thousands ways to accommodate cream cheese in sushi, but I’ll show you why the Devil’s Advocate is my go to example. 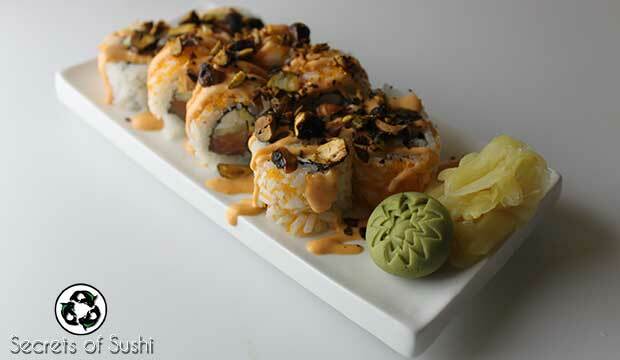 This recipe makes 3 Devil’s Advocate rolls. 1. Preheat your oven to 300 degrees. 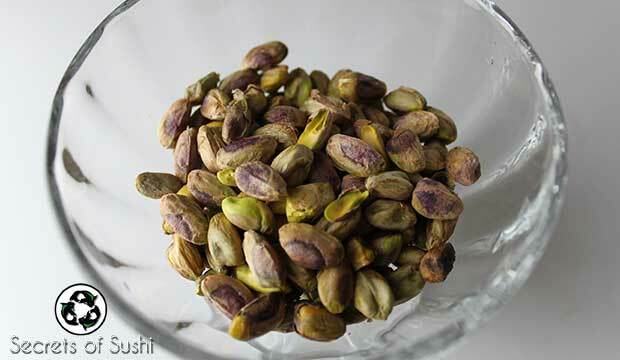 Remove the shells from the pistachios. I weighed 1 lb before removing the shells. 2. Put a pan on the stove and melt 2 Tbsp of butter on a medium heat. 3. 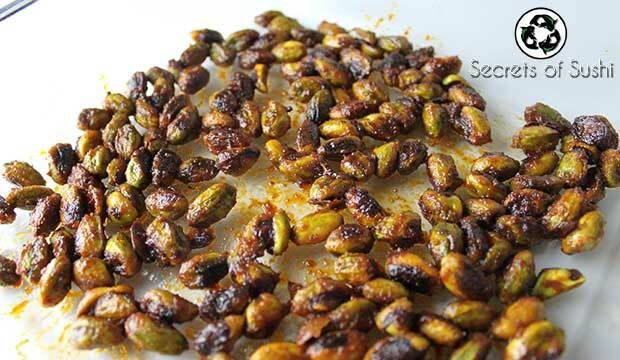 Once the pistachios are coated in butter and have been seared on at least two sides, add 2 tbsp of Sri Racha. Warning: heating chili sauce may irritate your eyes and lungs. If you have a vent on your stove, please use it. 4. Reduce the heat to a lower setting and allow to simmer for approximately one minute. 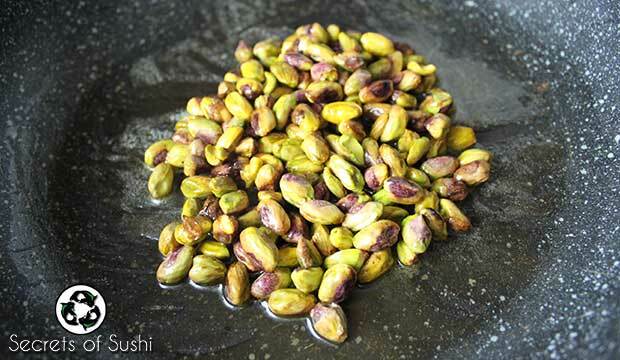 Then, place the spicy pistachios into an oven-safe dish. 5. 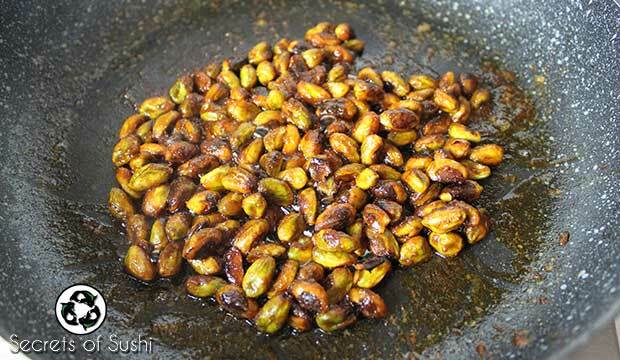 Once your oven has reached 300 degrees Fahrenheit, place the pistachios into the oven and bake for approximately 4-5 minutes. 6. 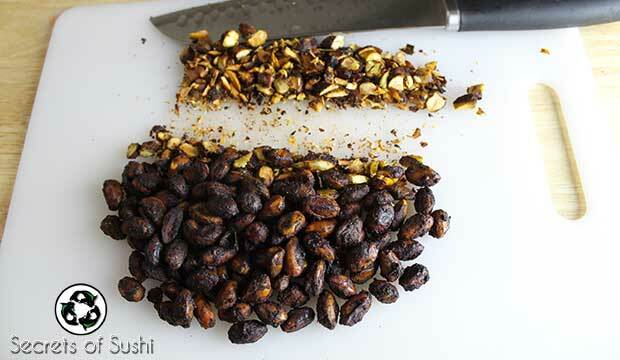 Place the pistachios onto a cutting board and chop them using a knife or food processor. Make sure you keep an eye on them! 1. 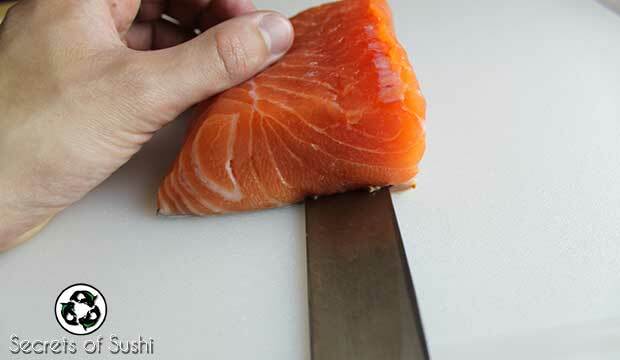 Pat the salmon dry with a paper towel. 2. Notice the brown portion of the meat? 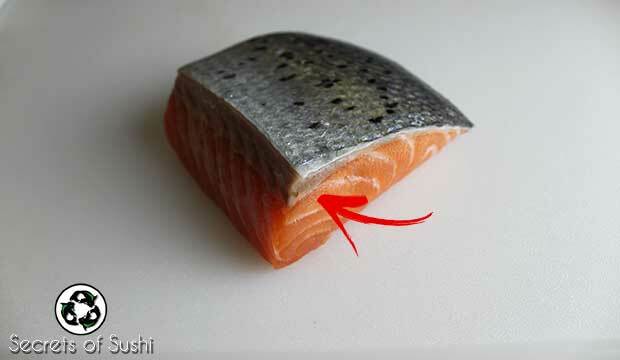 We want to remove this with the skin (In this example, I am using 1/2 of a standard fillet). 3. 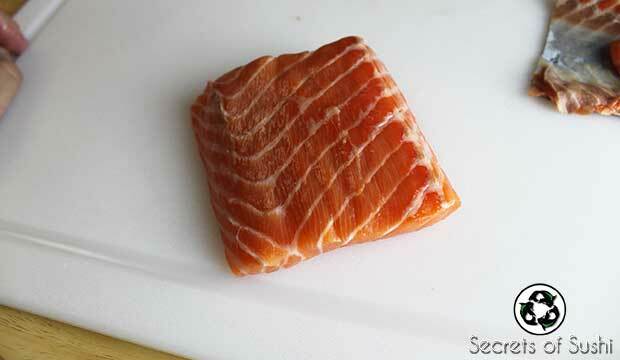 When possible, start your slice at the brown colored portion and slice towards the thinner part of the meat. 4. If there are any brown portions of meat left, carefully slice them off. 5. Make 3 slices approximately 1 cm thick. 6. 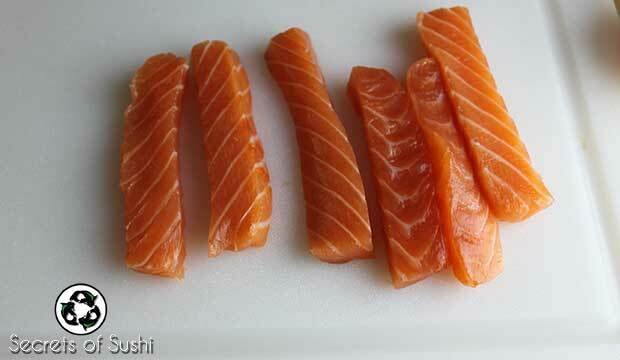 Slice them again in half, making 1cm by 1cm pieces. 6. Ready for the secret? 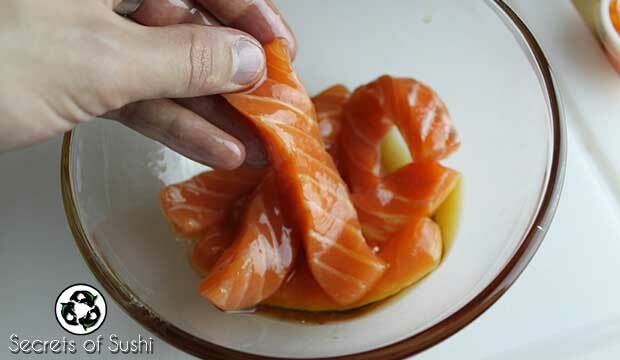 Marinade the salmon in sesame oil. 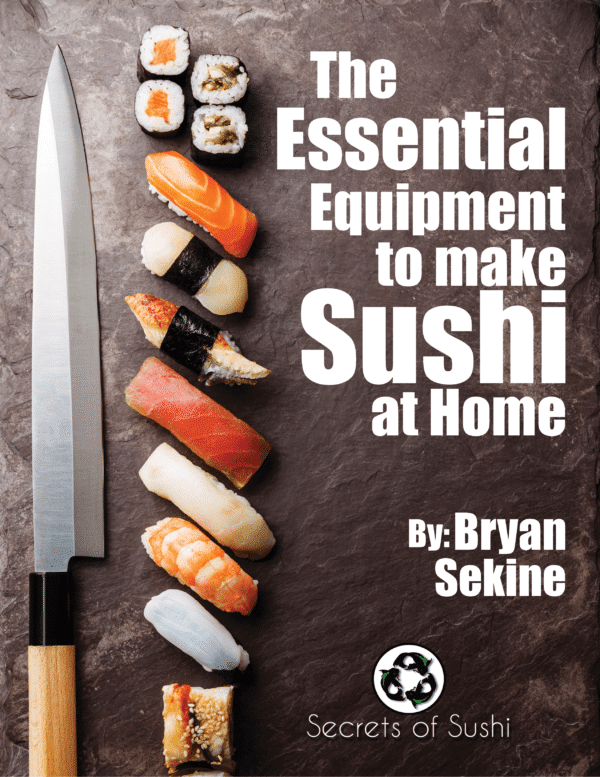 Sesame oil has several health benefits, but it also adds moisture to the roll (to counteract the dryness of cream cheese) and gives an additional layer of flavor on top of the salmon’s natural oils. 1. 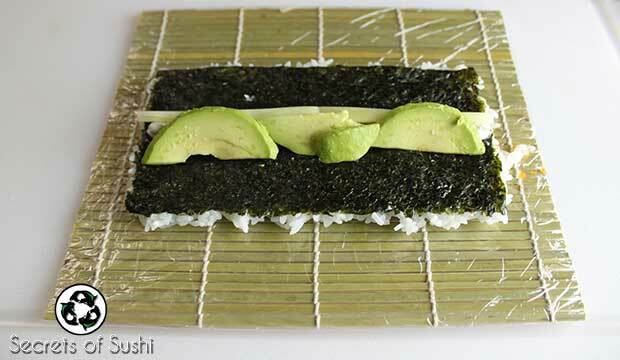 Add sushi rice to the rough side of the nori sheet. 3. 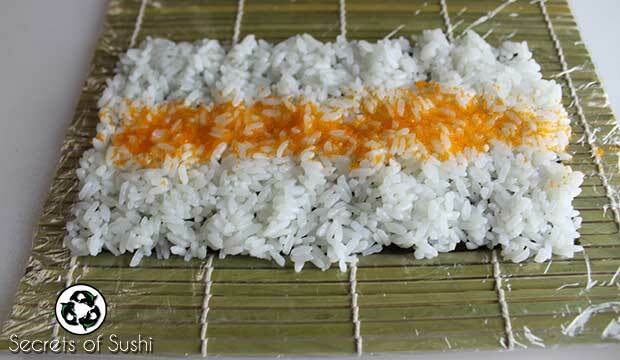 Flip over the rice mat and add small amount of cream cheese. 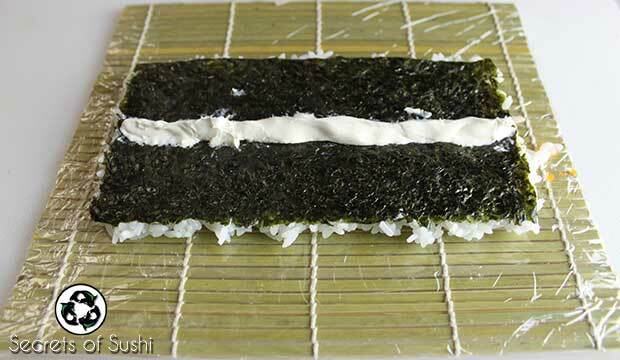 I usually try to put a pencil-width amount of cream cheese in sushi. 4. Add a few pieces of cucumber and a few pieces of avocado. 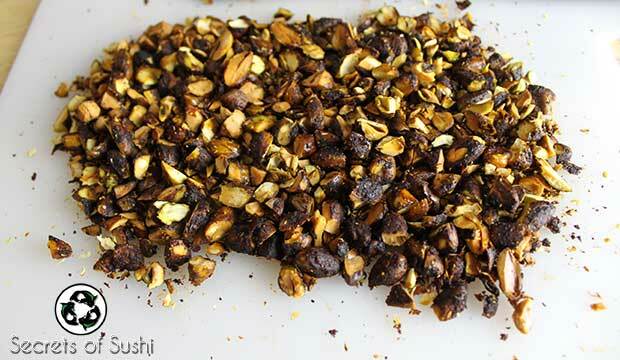 Ideally, you want to have a consistent amount of ingredients from end to end. 5. 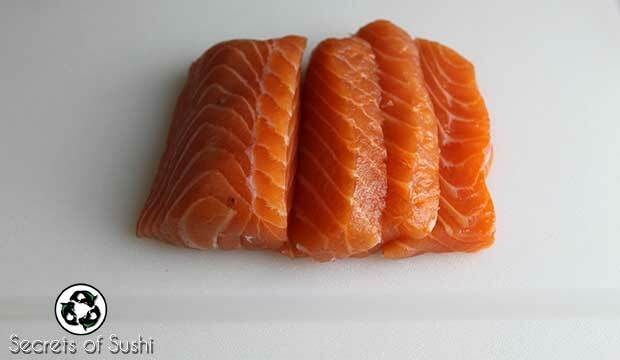 Add 2 pieces of sesame salmon. If the two pieces don’t reach end to end, slice each piece diagonally and slide them apart to make them reach the ends. 6. 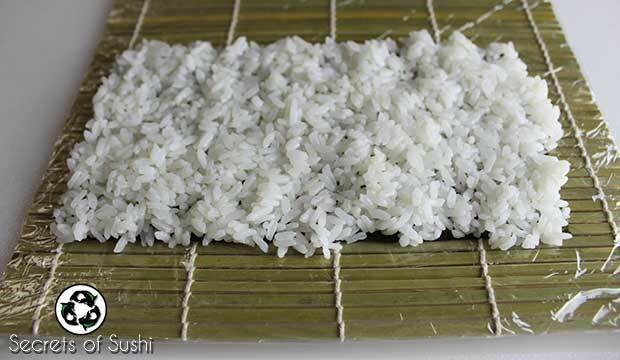 Using your thumbs under the makisu and your fingers to hold the ingredients in place, roll everything together. 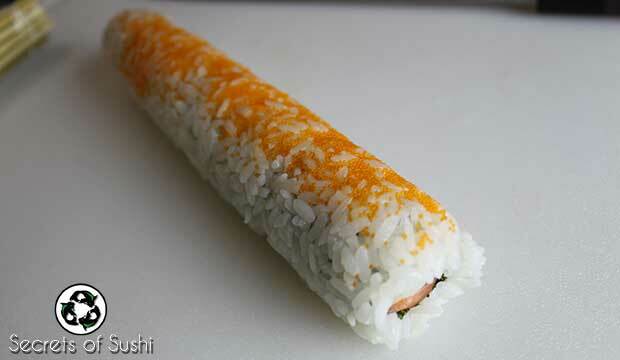 For additional details on how to roll, check my tutorial on Rolling Sushi. 7. 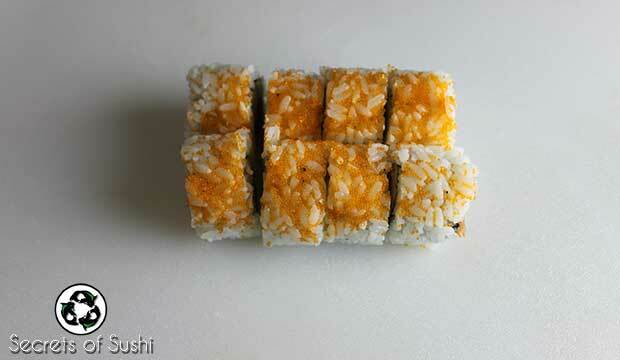 Using your sharp knife, cut the roll into 8, even pieces. 8. 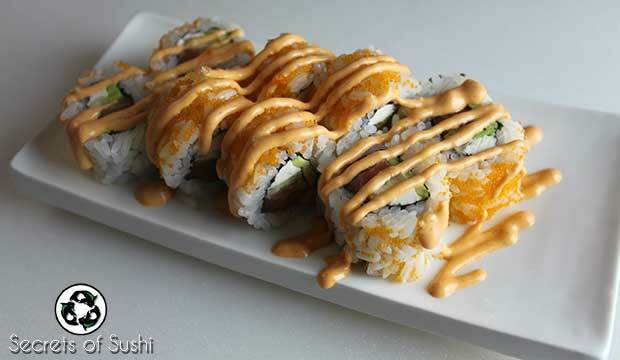 Place the roll on a plate and drizzle Spicy Mayo on top. 9. 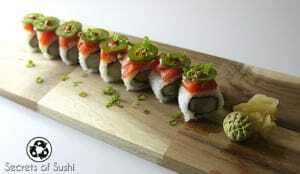 Sprinkle spicy pistachios on top, add wasabi and ginger to your plate, and enjoy! Itadakimasu! There you have it. If you want to learn how I make that wasabi lotus, subscribe to the email list using the form below – I’ll email you the steps! 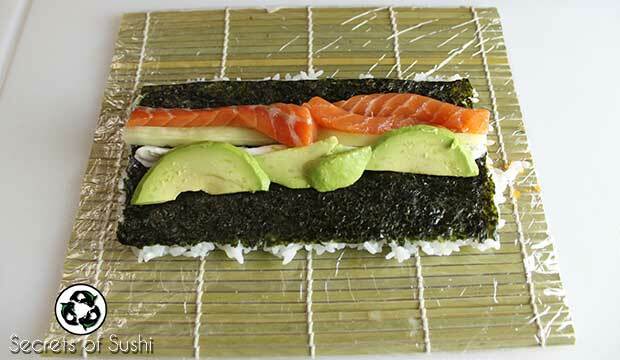 Let me know what you think about this roll in the comments section below or show some love on our Facebook Page!